Boatyards and marinas are the garages, workshops and termini of the boating fraternity. To the fish that inhabit their waters, they are more like a staff canteen -offering warmth, food and shelter among the traffic and activity of boat enthusiasts and bargees. They can provide terrific sport for the angler who selects his moment and attends to the likely spots in this changeable environment. Boatyards consist of channels, jetties and buildings close to a river where boats moor up for repairs and construction work. Some features here are fish holders but you have to take care in your approach. In summer these are very busy places. The activity tends to scare any fish away from the area during the day. Anglers get a cold reception from owners, who often do their best to discourage fishing in the yards. Even in the night or early morning you might be better off giving other parts of the river your attention. In winter fishing in boatyards is a completely different story. At this time of year the river often floods and the fish move in to boatyards seeking shelter. Because of the boat activity, which stirs up silt and hinders light penetration, there generally isn’t much weed in boatyards either in summer or winter. Roach, dace and chub congregate instead underneath unused boats which provide the protection and cover normally offered by weed. A marina is basically a harbour for yachts and pleasure boats. Most modern inshore marinas are made by joining a lake or still water to the main river by a comparatively narrow entrance. Boats are taken off the main river through the deep narrow entrance to be moored in the safety of the marina’s deep, calm waters. As boating has increased in popularity there has been a subsequent increase in demand for marina mooring. More and more marinas appear every year as businessmen jump on the bandwagon. 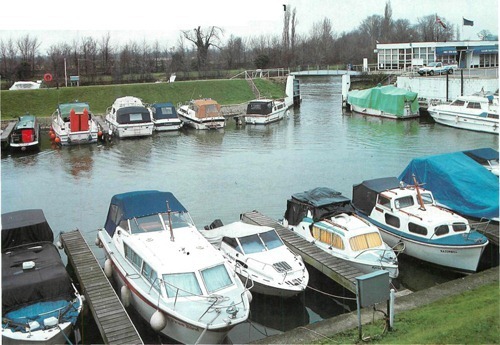 They buy up lakes and gravel pits close to rivers, with the long-term aim of obtaining planning permission to breach the bank to produce yet another cheap marina. This avoids the cost of excavating from scratch and appears to be the trend for future developments on many river systems. Once the bank is breached the building of club houses and similar facilities starts. The banks near the buildings are often concreted and fully developed while the banks farther away from the expensive facilities are often left in their natural state. The manner in which a marina is constructed has certain implications for the angler. If it is formed from a mature gravel pit then it will hold a stock of fish from the original pit. But if it is completely artificially produced then no natural gravel pit stocks will be present. This is the reason why some marinas hold large stocks of tench while others hold only natural river species. There are usually a lot of valuable boats and equipment around marinas, so fishing is often restricted for security reasons. Areas containing facilities for boat owners with access to the boats are generally kept out of bounds for anglers. Where fishing is allowed it is generally confined to the banks that are clear of boats. Marinas in summer can be very busy places with boats coming and going and clouding up the water – which makes them dirtier than other comparable still waters. The best angling results in summer are when the boats are not moving. Between dusk and dawn the fish tend to move from their daytime hiding areas in bankside reeds and under banks and disused boats to feed in the main area of the marina. The species you catch again depend on the water’s history. Marinas formed from mature still waters tend to produce more and better lake species such as tench, bream and carp. These species are particularly prone to grazing between dusk and dawn in the deeper open navigable part of the marina. However, once the boat traffic really starts they soon disappear to their hiding places. Smaller species such as roach, skimmers and rudd tend to feed well during the day- light hours in shallower water near reeds, weeds or obstructions. Sometimes carp can be seen in similar areas and in lily beds. Large carp are a common sight in many Thames marinas as they bask in the sun away from the boat traffic during the heat of the day. Many marinas also hold a head of pike and large perch which lie in ambush for their prey species at any suitable point. Sometimes marinas contain unusual features such as dumped cars, which are a bonus snaggy point of attack for predators. In a winter flood marinas can offer some of the most productive fishing in the river system as fish shoal up in the marina seeking shelter from the fierce currents of the river. The marina tends to colour up like the main river, but the parts farther away from the river are often not so highly coloured -which makes fishing much easier. Again, the fish tend to shoal up in marinas under unused boats that offer shelter. Unlike the boatyard the water is calmer and attracts more bream and roach. Sometimes natural still water species such as tench, crucians and other carp are stirred up into a feeding frenzy by the influx of river water. In floods chub are also found in marinas. Normally they congregate near the mouth of the marina, in snaggy sheltered spots. In a severe flood they can be present in great numbers. Once the colour begins to fade the big perch and pike start to hunt in packs, feeding on the large shoals of roach and bream sheltering from the turbulent waters of the river. Where there is a good head of bream the pike can grow to specimen proportions. Big perch on the other hand thrive on the supply of small roach.